Community discussion meeting, Jan. 21, 2015. All photos by Matthew Wood. 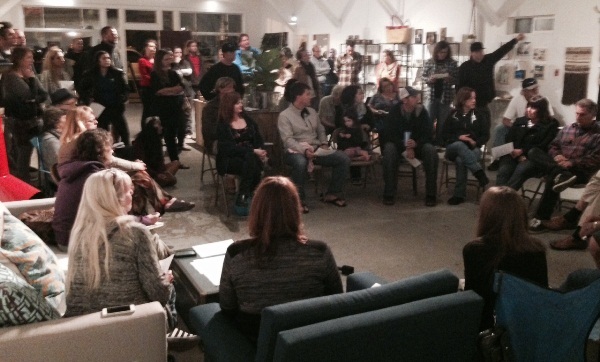 That was the underlying theme from Wednesday night’s Ocean Beach community discussion, which mostly surrounded the spate of break-ins in the neighborhood. About 60 people gathered at Teeter on Niagara Avenue to talk about littering, vandalism and other topics. But the conversation invariably came back to the eight reported burglaries in the neighborhood over the past few weeks that have gained media attention. 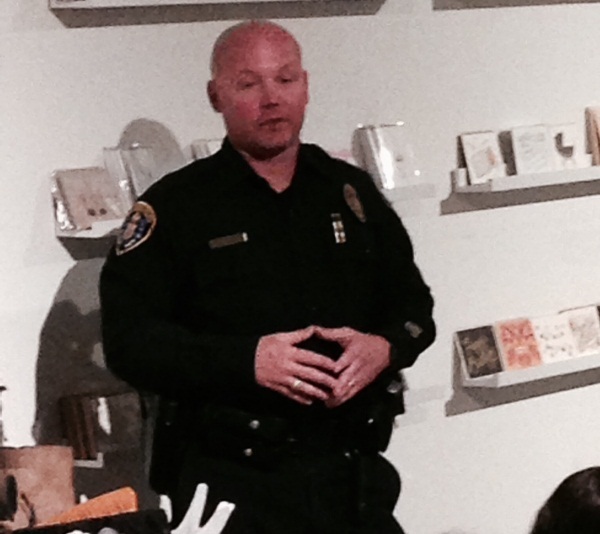 David Surwilo, the community relations officer for SDPD’s Western Division. “The common denominator is unsecured homes,” said David Surwilo, the community relations officer for San Diego Police Department’s Western Division. A number of speakers told stories of having their homes robbed. Solutions were offered, such as added lighting outside of homes and having an air horn handy in case of an incident. Many said they will take pictures of any shady characters hanging out near their homes. But most agreed the top deterrent is keeping your place secured. Clayton Conley said he was one of the recent victims, admitting he had left his home unlocked for just a few hours. He said he’s not necessarily in favor of an increased police presence, as others suggested. “I would much rather have this conversation be about locking our door, rather than putting a cop on every corner,” he said. Serwilo said most of the cases have been similar. No weapons were reported. Most were between 3 and 5 a.m. He said the street crimes team has adjusted their hours, working the beat well past their normal time of midnight each evening. While the homeless issue was an underlying theme, most agreed they were not necessarily the problem. Surwilo said none of the break-ins are believed to have been committed by a homeless person. “We just don’t know that,” he said. Sarah Windy, one of the meeting’s organizers, said she considered the meeting a success. They plan to take the topics discussed to next week’s Town Council meeting. Windy said she wants to start a neighborhood crime watch, although no specifics were offered. The overall vibe of the room was that people just wanted to feel safe. There was also agreement that communication between neighbors could go a long way to combating the problems. Windy said she hoped Wednesday night’s even could serve as a starting point.